Are mustangs really a non-native species? For the past few months, I’ve been involved in a training course to become certified as a Texas Master Naturalist. It’s a program whose mission is to train a corps of well-informed volunteers to provide education, outreach, and service to help with the beneficial management of natural resources and natural areas within their communities for the state of Texas. It has been a great experience, and I’m looking forward to starting my volunteer service—likely for the Katy Prairie Conservancy—now that the training portion is drawing to an end. Tuesday was our last class and each of my class members was expected to give a 5-minute presentation on the topic of their choice. [The BLM’s] mission is to protect native species from non-natives that would harm the land. If the horses are non-native, they are viewed as part of the problem and not a valuable form of wildlife. The problem with situations wherein a new species that not native to the area is introduced is that they compete with the natives for resources, and can choke them out. The native species are integral to the ecosystem, like plants that provide food for pollinators such as bees and birds, and if they are diminished, it can throw everything out of balance. If a food source for pollinators is decimated by an invasive species taking over, it can disrupt every level of the food chain. Currently, there are over 44,000 horses in BLM holding pens throughout these states, most of whom have never interacted with humans. The cost to keep these horses is about $50 million a year—which is 2/3 of the BLM’s entire budget (they do a lot of other stuff besides manage horses). The Wild and Free Roaming Horse and Burros Act prohibits the sale of these animals for profit (meant to prevent their sale for slaughter), and a number of these horses are able to be adopted. But that’s not enough. The Bureau has considered drastic measures to deal with the problem. What I hadn’t realized prior to working on this presentation is that the BLM classifies the horses as a non-native species, and this classification frames its management decisions. Their mission is to protect native species from non-natives that would harm the land. 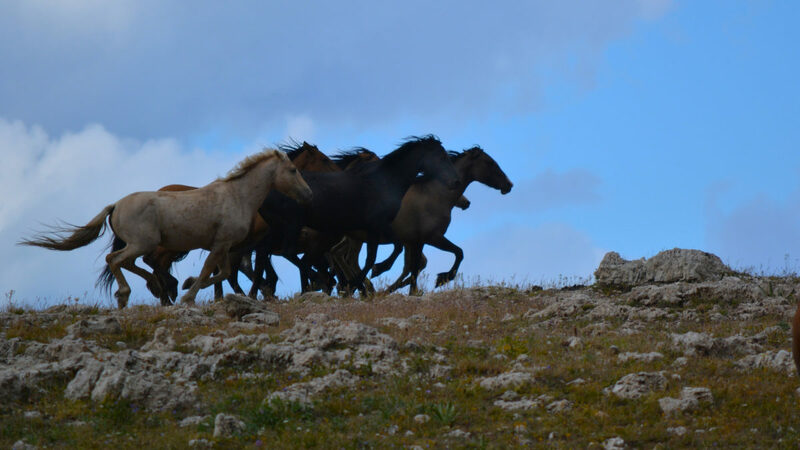 If the horses are non-native, they are viewed as part of the problem and not a valuable form of wildlife (not to mention an enormously symbolic one in American heritage) to be protected. However, fossil evidence has shown that horses did once reside in North America before the arrival of the Europeans. In fact, it was a center of horse evolution. Wendy Williams offers an excellent read on this topic in The Horse: The Epic History of Our Noble Companion, which chronicles the fossil evidence showing the North American horse’s evolution through millions of years as it adapted to drastic changes in climate and the subsequent rise of the grasslands, and the evolution from a four-toed creature to the one-toed creature we ride today. For reasons not entirely understood, after millions of years of evolution and adaptation the fossil record indicates the North American horse became extinct around 13,000—11,000 years ago. Luckily, animals from the genus Equus had already migrated via land bridges to other parts of the globe—Asia, Africa, and Europe—making them available to the Europeans who reintroduced them to North America in the 1500s. And herein lies the crux of the debate into whether these animals can be considered native or non-native: Is the species that was brought by Europeans to the Americas (Equus caballus; the horse as we know it today) the same species that was present in North America 13,000–11,000 years ago and became extinct? -The fossil record indicates that Equus caballus is about 2 million years old and originated in North America, and there is no evidence for its origination elsewhere. -While the genetic analyses of mitochondrial DNA do not indicate the origination of the Equus caballus species, it does indicate that it underwent genetic divergence around 200,000 to 300,000 years ago—from which we can extrapolate that if it was present that long ago, surely it originated earlier than the 11,000—13,000-year time frame given by the fossil record for North American horse extinction. -Furthermore, the study of many species’ genomes has led to the reconsideration of much of our taxonomy—showing that animals we believed to be related may not be, and showing that we have perhaps been overzealous in species splitting, creating subspecies based on observational differences that are not reflected on a genetic level. This seems to be the case with horses as well. Genetic analysis indicates that Equus caballus is genetically equivalent to Equus lambei, the horse that according to the fossil record was the most prevalent and recent species in North America prior to extinction. Does this information make any difference to the 40,000+ horses now sitting in pens? Not likely. But this points to a serious gap between scientific research and the management decisions made by governmental agencies in charge of the protection of our public lands. It is vital that this gap is closed so we can begin using fact-based evidence to manage our lands and natural resources—not just the bottom line of a corporation, the rhetoric of a politician, or the hysterical ranting of people on the Internet who think they are “raising awareness” but who are, in fact, fear mongering and spreading ignorance. Jess Filippi is a freelance writer and editor based in Houston, TX. An English rider for most of her life, she now leases an American Quarter Horse, and is training to compete in Western riding disciplines. See more of her writing at jessicafilippi.com and urbanequestrianblog.com.